As you probably remember, Otis is seen at the beginning of Cars 2. 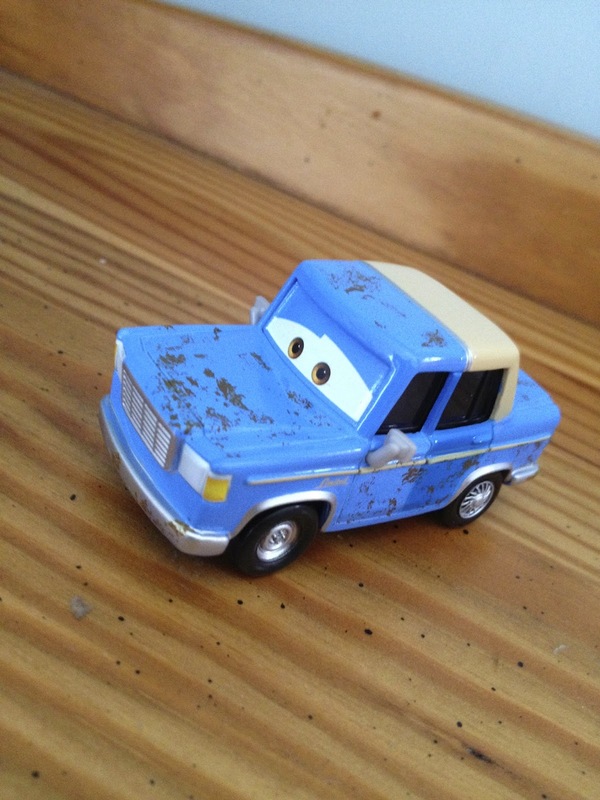 He's the town's "lemon" broken down on the side of the road when Mater comes to save the day. This character was added into the film later into the process when director John Lassester realized he needed to do some explaining as to what a "lemon" car is, which is ultimately just a nickname for a poorly made car that breaks down often. This is a 1:55 scale diecast vehicle from Mattel. He was released in 2012, but was one of the harder ones to find (even though he's not a chase car). I don't think I ever did end up seeing him in the stores at the time, this one was from eBay. Fun fact: In the film, Otis was voiced by Jeff Garlin, who has voiced characters in two other Pixar films: Captain B. McCrea from Wall-E and Buttercup the plush unicorn in Toy Story 3. His license plate is 06 05 62, the birthday of Jeff Garlin.